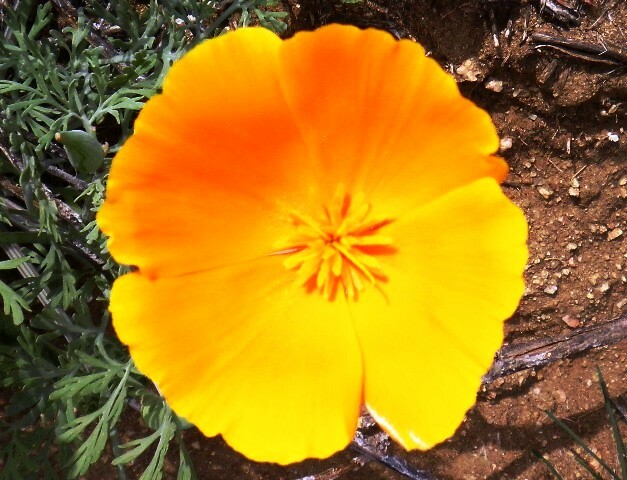 I took myself on a trip to go hunting for wild poppies. To be honest, it wasn’t much of a hunt. I had a location, maps to show me the way, and a whole day to follow wherever the road might lead me. I generally get lost when I’m by myself — a map doesn’t do much good if you’re driving and can’t look at it, and non-existent road signs only exacerbate the problem. (A gps in my phone doesn’t help if the battery goes dead.) Still, I took only a couple of easily corrected wrong turns. I drove on long stretches of desert highway, and then I saw it . . . a poppy nodding in the wind by the side of the road, and I knew I was on the right track. 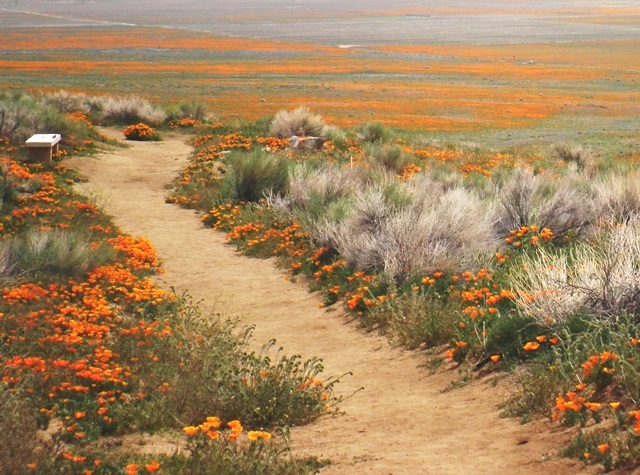 Gradually, the poppy blooms increased — lining the roads with streams of color. Off in the distance, the hills glowed orange, and my heart quickened at the realization I was in for a special treat. Many people just stopped by the side of the road to take photos of the poppies, but I paid to enter the reserve and walk along the miles of paths. 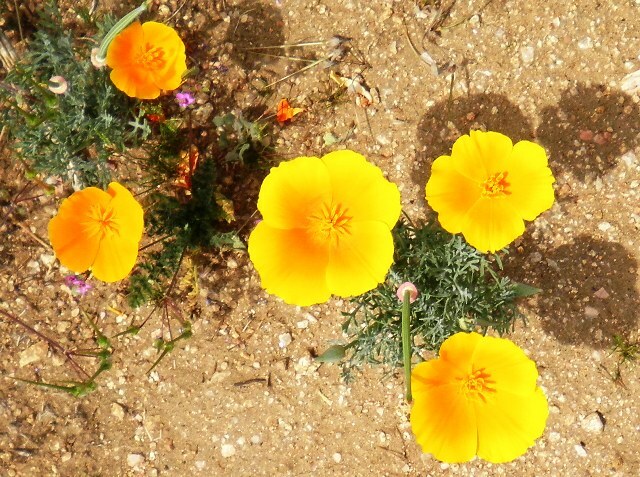 I heeded the rules and did not feed, pet, pick, or trample the wild poppies. The reserve is a natural habitat, with no artificial stimulation, not even any watering. The land is left alone to do with as it wishes. And this year it wished to shower me with color. Oh, my. 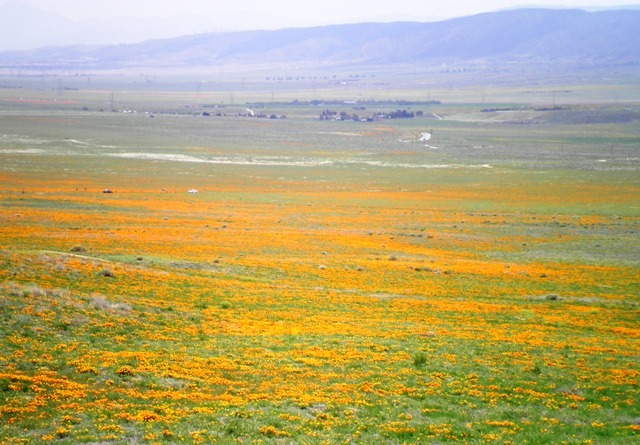 I’ve never seen anything like those swaths of poppies — it was as if a sunset had fallen from the sky and lay at my feet. It truly is good to know that in all the turmoil of the world, in all the fights between industrialists and conservationists, in all the swirl of population growth, in all the land-grabbing and land-grubbing, there exists these pristine spots where we can refresh our souls. A bucket of water will take care of the witch. Oh, I’m sure they’ve already tried that on Once Upon a Time. Just have to see what happens in the next episode. Maybe have a house fall on the next witch that comes along. I’ll talk to the Evil Queen next time I see her. wasn’t it beautiful ? its been about 20yrs since i have been there I need to take carlos to see them! Oh my goodness. That is absolutely beautiful! I take it that these poppies aren’t that wild. They are not like the poppies you find in Afghanistan that are sometimes used for medicinal purposes. Not the sort you get opium from. 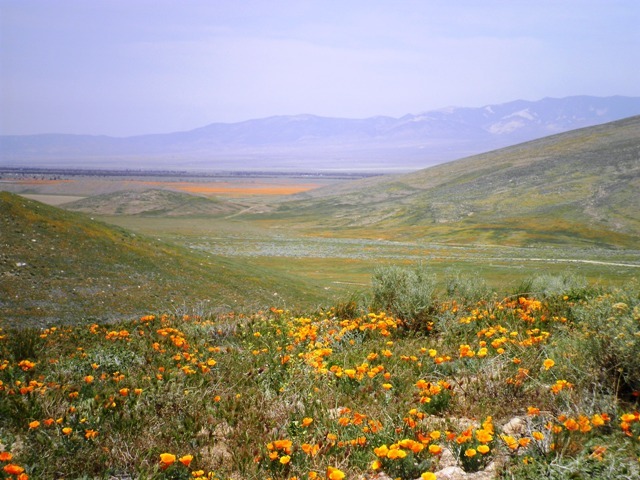 These poppies are wild, and they are indigenous to the area, but they are not opium poppies. I think the large red opium poppies are gorgeous, but unfortunately, they are illegal here. I believe the opium poppies can be grown but under strict licence. There are some heart medications that are opiates. Strangely enough, opium can enslave and kill but it can also save lives and keep people with certain heart conditions alive. What a wonder! Thank you for the beautiful pictures! Just lovely!! Thanks for sharing!! Oh I wish to have seen this. But it’s almost as good to know you’ve seen it for me. This brings to my mind a time, years ago, when I found lupine growing alongside the highway as far as I could see. The sky and the field met at the horizon in a riot of blue. Wonderous. Thank you for this sire. So many sights are overhyped, but this one was truly awe full. And that wasn’t even considered to be a good year for the poppies. I thought going back this year, but the drive is too long to risk my still-healing arm. Maybe some year we can meet there and walk the sunset-colored paths together. « Break Time is Edited and De-Widowed!